Paperboy (ペーパーボーイ) is an arcade game developed by Atari Games which was ported to variety of systems since its initial release in 1984, including the Sega Mega Drive, Sega Master System and the Sega Game Gear. The Mega Drive and Game Gear ports were handled by Tengen, while the Master System version was handled by U.S. Gold. The Master System version of Paperboy was the first game for the console to be developed in the United Kingdom. 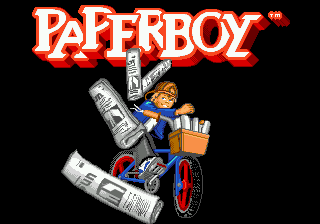 In Paperboy, players control an unnamed paperboy riding a bike while attempting to deliver papers on one of three streets. While you can speed up and slow down with and respectively, the bike continously moves towards the top right hand corner of the screen, so the player also needs to navigate the street and avoid any obstacles to avoid losing lives. The objective is to throw papers horizontally to the left, attempting to land them on the doorstops (or letterboxes) of subscribers. If the player misses a house or breaks a window by mistake, that house will be lost as a subscriber. If there are no subscribers left, the game ends. To gain subscribers, the opposite has to be done - papers have to be thrown at the windows of non-subscribers. There are a limited number of papers (with refils being placed around the level), and at the end of a street, the player rides through a short obstacle course with targets that grant extra points. Points are also awarded for hitting other targets on the street, such as for example, burglars attempting to get into a house. Paperboy was followed by Paperboy 2.